Tape is one of those things that you often use, but rarely think about. X-treme tape is a non-adhesive, self-bonding wrap. It's not really "tape" since it's not sticky. But it really grips and wraps around wet stuff or slimy stuff --- think water exhibits, hoses, bubble exhibits, etc. Once it's in place -- it is NOT coming off! You just pull on the tape and it fuses to itself under tension. As a bonus it comes in a range of colors as well. Any discussion of tapes, and especially duct tape, would be incomplete if we didn't mention the annual "Duck" brand duct tape "Stuck At Prom" Scholarship Contest. Duck makes duct tape (a little confusing, I know) and holds an annual contest for couples to create a complete set of prom outfits using duct tape! (You can see one example at the top of this blog posting.) 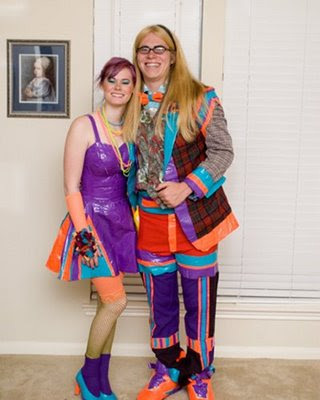 Also check out the completely mind-boggling array of past contest entries at the Duck Tape website. Have any favorite tapes that we've missed? Leave us the info in a comment below!